If live music in a fun setting is preferable than the throngs of wild drunken partiers at Ballroom, come out to Iota on Oct 31 for three live bands. 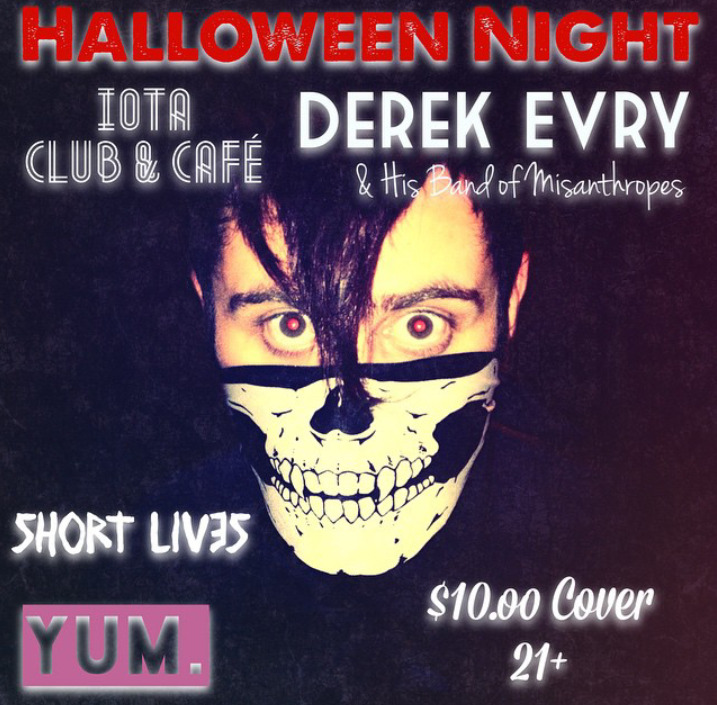 The very talented local musician Derek Evry leads His Band Of Misantropes on Halloween night. Music starts at 9pm with Yum and Short Lives, $9 covers you for all three acts. More info on their Facebook event page. It's that time of the year again for the biggest party at Clarendon Ballroom on Friday, October 31. The annual DC 101 Elliot in the Morning Halloween party is the best night of the year at Ballroom, with party goers in creative costumes packing both the dance floor and rooftop to compete in the $3,000 grand prize costume contest. Last year's winner was the Invisible Man homemade costume. The night starts at 8pm and cover is $15 before 10pm. Usually there will be a line wrapping around the block to get into Ballroom, so try to get there before 11pm. For costume contest rules check out DC101's event page. 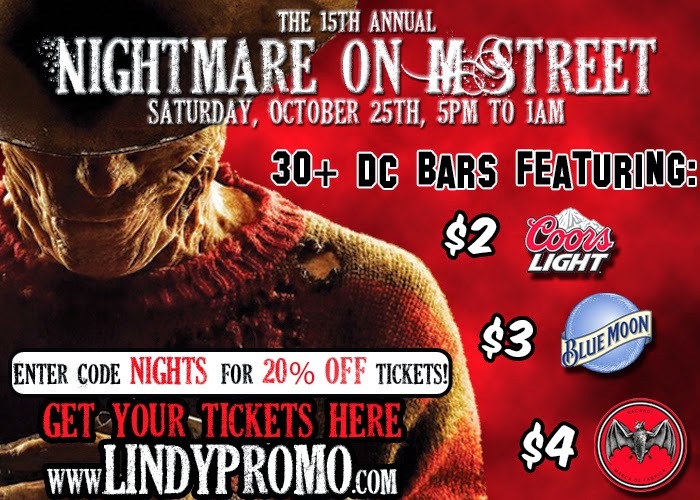 The 15th annual Nightmare on M Street will take place on Saturday, Oct. 25th thrown by Lindy Promotions. From 5pm-1am you can enjoy $2 Coors Lights, $3 Blue Moons, and $4 Bacardi drinks at over 30 DC bars spanning from Dupont to Chinatown! Tickets are $20 on sale now and you can use my promo code NIGHTS to save 20% off that until Oct 17. If you are a fan of eclectic vintage variety shows don't miss the bands at Iota on Friday Oct 10. This is a special show for the band, as the mother and father team of Hot Buttered Nuggets will be opening for their daughter's band that night, Miss Tess and the Talkbacks. Miss Tess is a Brooklyn-based singer and with her band make grooving modern vintage music that nods to the traditions of saloon jazz, country swing and early rockabilly. The Talkbacks have just released The Love I Have For You, their second on rootsy label Signature Sounds. $12 cover and music starts at 9pm. 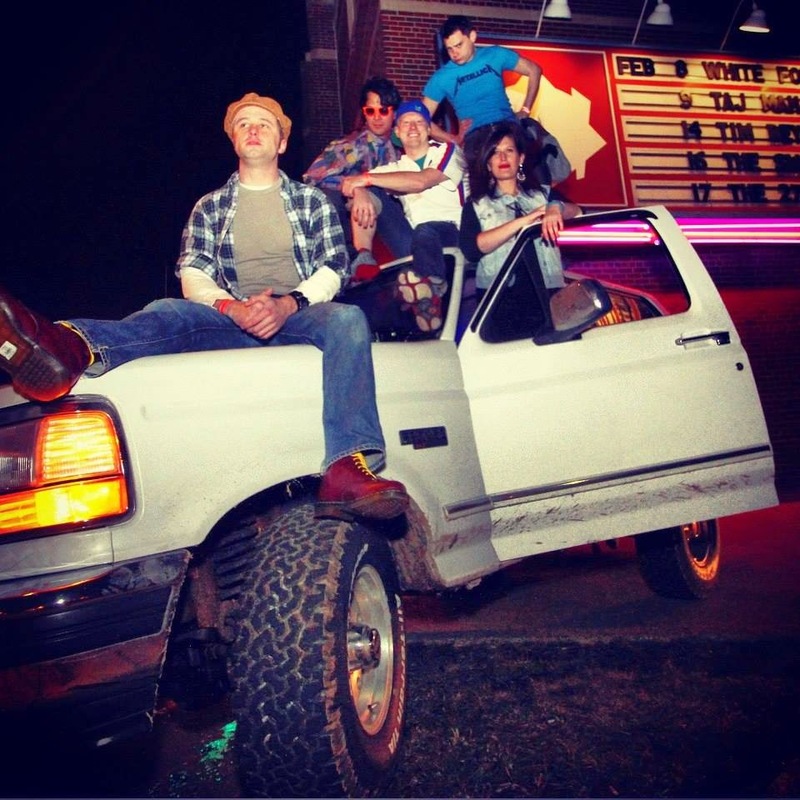 The awesome 90s cover band White Ford Bronco is playing tonight, Thursday October 9 for a free show! One of the best local cover bands I've seen is on stage at Clarendon Grill at 9:30pm without a cover charge. 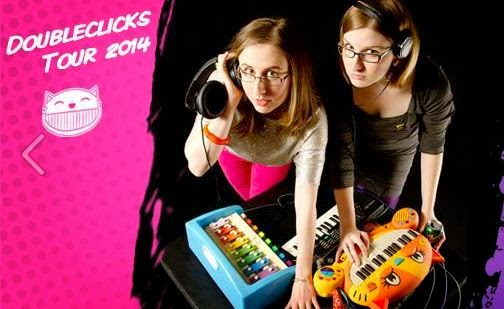 I've been looking forward to the super geeky fun of The Doublclicks returning to Jammin Java for a while. When I last saw the Oregon based sisters Angela and Aubrey Webber at the Vienna venue I was laughing out loud at their whimsical and catchy original folk-ish songs like Lasers And Feelings and Spock Impersonator. They change up some of the lyrics for their live performances and have great audience interaction with their nerdy tunes themed around Star Trek, Dungeons and Dragons, Minecraft and dinosaurs. Tickets to Monday's 7:30pm show is $12 online or $15 at the door. Local super talents Andy Zipf, Ben Tufts, Adam Neubauer and Ryan Walker form The Cowards Choir band playing at Iota this coming Saturday, Oct 4. This DC based band is releasing their new EP Cool Currency that night with Justin Jones opening for them. 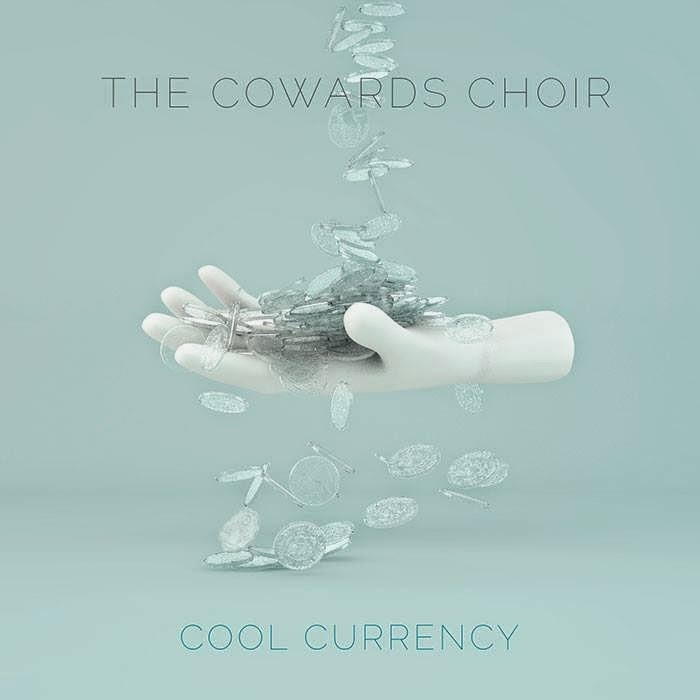 In August of 2013, The Cowards Choir released the Reunion EP. Less than a year later, they have been featured on WAMU 88.5 Metro Connection, nominated as one of DC's best upcoming bands by Deli Magazine, and mentioned on Rollingstone.com after backing up Nirvana bassist Krist Novoselic during a surreal performance of Lorde's "Royals". Their thrilling live show continues to evolve, driven by their camaraderie and the shared desire to make music that creates connection. Advance tickets are available online here for $14, or $15 at the door. The first 30 people to purchase tickets will be invited to a special listening party at Republic one week before the show.